The Schoolies Support Service lead by BUDDI Byron Inc. is just so good at what they do (award winning good). We scored a huge chat with the Coordinator of the Byron Bay Schoolies Response Nicqui Yazdi and here it is. FYI they need donations and volunteers. Massive respect to everyone involved in helping at Byron during Schoolies, and Nicqui Yazdi in particular for her decade long and enduring commitment to schoolies safety. What's your name age and current job? Nicqui Yazdi 51 - Coordinator of the Byron Schoolies Safety Response and Team Leader of the BUDDI Community Drug Action Team and Local Drug Action Team. Where did you graduate high school? I didn't finish high school, I left school at 15 and immediately went into full time work. Although I have studied throughout my adult life, I do often wish that I had stayed at high school and gone on to university at that age. What exit score did you get? A high five from my friends, who I think were a little jealous that I left school so young when they were still there for a few more years.These days I am a little jealous of the fact they stayed and I didn't! Did you complete tertiary studies and if so what in? I have done many courses throughout my life, but no university studies. Did you celebrate your own schoolies, if so where? I went to Schoolies on the Gold Coast in the very beginning, within just a few years of it becoming a 'thing'. Even though I had already left school, I attended with a bunch of boys from my own home town, and was meant to be their 'Den Mum' as such. I was 15, they were 17. It was nuts to say the least, and we had a seriously awesome time! I guess my work now is a bit of payback for helping to make schoolies into an institution! Where did you go / what was the best part and not so best part of your experience? The Gold Coast, which back in my days was the only schoolies destination happening in Australia. The best part was of course the beaches during the day, as I came from a country town, so the beach was a treat and much needed after the big nights we had! The worst part, was recovering from too much alcohol and regretting how much I had drunk. Do you have a funny anecdote to share? Well, it is kind of funny now, but it was super uncomfortable at the time... I got a bit too drunk on our first night and decided to watch the sun come up from the beach near our apartment. I didn't end up seeing the sunrise at all, instead waking up at nearly 11am, still in my frilly very short polka-dot dress and hot pink undies, face down in the sand. I realised I had been seriously sunburned and nowhere worse than that little fleshy strip of skin just under my undies! Holy dooly, I could barely sit down for the next week, the backs of my legs were so sunburned that they blistered and the skin all came off in patches, the worst though was the top of my legs, and that fleshy bum bit just under my undies! What support services did you or your friends have contact with? Back then there were no services unfortunately, but I walked into a local chemist and the pharmacist was very helpful in selling me a burn cream that did help to ease the pain of my sunburn. It's so fantastic these days though, that schoolies have such great access to support services such as the Red Frogs and others, like our Byron Schoolies HUB volunteers, where we do lots of minor first aid, including for sunburns. Did anything bad happen to you or one of your friends at schoolies - e.g. violence, sexual assault, theft, dodgy companies etc? No, we were a lucky bunch, and even though the numbers even back then were in the thousands at the Gold Coast, it was a very different scene to now, and even though we did have alcohol and probably did drink to excess, nothing bad happened to any of us, and we didn't see any violence either. The worst thing back then was having to wait for tables to have breakfast at Charlies in Surfer's Paradise. What is your current involvement / impact on young people celebrating Schoolies (at what destinations)? This is my tenth year (2018) of running the Byron Schoolies Safety Response, and it is the tenth year of the Schoolies HUB, both were my own idea when I realised that crime reached it's peak for Byron in late November and no one knew why. It happened by chance that I had a conversation with a Police Officer from Yeppoon, who was running the chill zone for schoolies there and I had an 'AHAAAA moment' that we actually had schoolies coming in November and December and this was why the crime rate peaked then. He suggested that I should attend the National School Leaver's Conference in Lorne (VIC) that year, so literally within a week, I went to Lorne and met all of the people running schoolies around Australia, but especially the Red Frogs, who told me they had been coming to Byron for years. I then came back to Byron and started to plan our own Schoolies HUB and within months it became a reality, with much help from the Red Frogs. The biggest impact we have had on schoolies celebrating in Byron, has been to reduce that crime rate to an almost negligible level. Of course there will be issues, but certainly not like they were before we recognised that all these young visitors were actually schoolies. If you could change anything about today's schoolies celebrations what would it be? I would try and get these schoolies to understand the impact of alcohol and other drugs on their still-forming brains and try to encourage them to re-think their drinking and drug use, go for the natural highs that places like Byron offer, the beaches, the music, the colourful people and chilled out vibe. It's a real pity that schoolies is synonymous with risky drinking, as the reality is that you can have so much more fun when you aren't hugging a toilet or a tree, vomiting, or waking up in strange places, or much, much worse. Life is way too short to spend the best days of your life wishing you hadn't done what you did the night before! Personally, would you encourage today's graduates to follow a similar career path to your own, and if so do you have any tips or advice for a young you perusing a similar path? Community services, youth work, health and AOD (alcohol and other drugs) work, is such a rewarding career path. Young people are our future and helping those that get off the track, to either get back on the track, or get the help they need, is such a good thing to be involved in. Best advice though is to follow your passions, never give up, and make a difference. Volunteering is a great way to get experience in different industries, but volunteering at things like schoolies festivals and community events, also helps not just the young people attending, but also dramatically helps the local community too. In a place like Byron, we all chip in and volunteer and even our young people have a chance to do this too. We have parent and teen teams helping in our Schoolies HUB, it's great for the teens to see schoolies from the flip side, before it becomes their turn too. Every schoolies destination is different, are there unique challenges to Byron? The most unique challenge facing Byron Bay, is the high numbers of tourists here all year round. Byron is a tiny coastal village, that sees more annual tourists than the entire state of Tasmania! Our residential homes have been eaten up in their thousands, into holiday lets, airbnb, and tourism accommodation, which has also increased the cost of residential rentals to way, way beyond any actual affordability for pretty much any of our workers. We have a declining residential population, and this also means that we are seeing less and less people able to volunteer with us. to fund Byron Schoolies HUB. Our Council does a great job, but the funds just aren't there to pay for maintenance of our roads and so much more. But as a community, we are working together to try to have Byron Bay's unique issues acknowledged and addressed by the Government. We need a bed tax and we need to have businesses such as airbnb give back to our community. At present Byron has 85 times the national average of holiday accommodation, this is a big problem for us, as most of these do not contribute financially to our community in any way. What are your thoughts on this three pillar concept in Byron Bay? Byron never has adequate Police numbers at any time. Byron has very few community support services, being a very small coastal village, not part of a big regional centre or major city. Byron has NO entertainment for young people under 18, and we have limited clubs and pubs to manage the high numbers of tourists that come here. We do a nightly open dance party in the park where our Schoolies HUB is situated, however this idea is not fully supported by Police, who don't yet recognise or understand that the music is the most important of our harm reduction / harm minimisation strategies. The nightly music allows us to gather most of the under 18's in one place, under lights, with adult supervision and it is the most important part of our safety response. 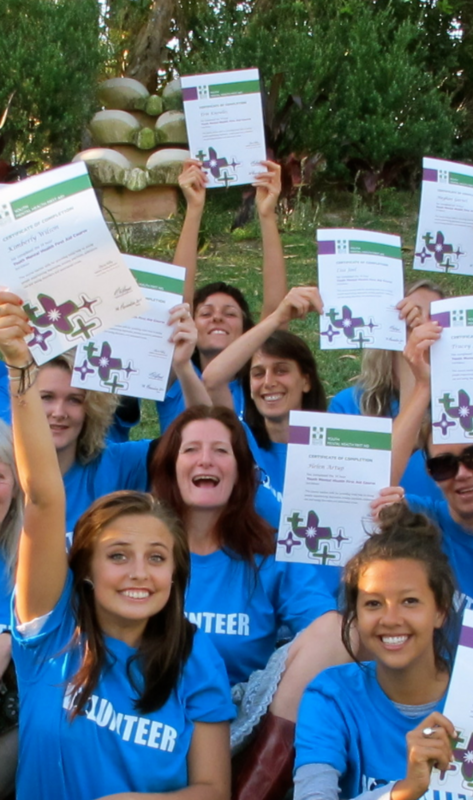 Another important thing we do, is to offer free training to our volunteers, things like First Aid, Youth Mental Health First Aid, AOD Crash Course and training that will not only benefit the work they do in the Schoolies HUB, but also other activities they are involved in through volunteering and even in their workplaces, or in the community as a whole. Sexual and physical violence are the most consequential possibilities facing young people celebrating schoolies, does your organisation contribute to the prevention of or response to these terrible realities - if so how? Our Schoolies HUB has been open 24 hours a day since we started ten years ago, well for the duration of school leavers celebrations anyway. We have a great range of resources, including a first aid station and free water and free condoms. We understand that things might happen at schoolies, some sexual experiences may not be wanted experiences too, so we assist where possible to help anyone who has experienced sexual assaults. Violence is a problem too, and the best thing we can suggest to schoolies coming here, is to watch out for your mates, always support your friends if they are unwell or drunk and never leave them alone. Our Schoolies HUB Volunteers are also more than willing to help with anything that the schoolies may need and we are great at giving any Mum / Dad .... cool Auntie / Uncle advice too. We have a great range of tongue-in-cheek 'Cringe The Binge' posters that really give the goods on sexual health, crime, assaults and alcohol and drug use and even though some of these posters look a bit humorous at first look, the information in them is actually very in your face too and we find the schoolies really take their time to look at these and take the information in. We also have a couple of really big Schoolies Bulletin Boards that we place posters and alerts on, for everything from dangerous drug alerts, to knowing when to call an ambulance. We like Memes and posters with a bit of humour, but also that give real facts to schoolies. Over the historical course of Schoolies Week in past decades, an average of one or more schoolies die each year. Anything you want to say about this topic? What is your experience / insight? We have been lucky so far in Byron that we have not had a schoolies death. But the reality is that schoolies and risky behaviour have gone hand in hand for decades. Our advice to schoolies would be never take drugs off anyone, seriously, have some good clean fun, enjoy the special time that is your schoolies, survive it, and live a long and happy life. Taking drugs these days is a massive gamble, you never know what they are. It's not worth dying for! Schoolies support services are often provided by services who work year round on other things, please give us a brief overview of the other services your organisation provides. Our organisation, BUDDI, also runs the Community Drug Action Team and Local Drug Action Team. We do all sorts of things, but our primary role is to look out for young people, with BUDDI standing for Byron Underage Drinking & Drug Initiative. Our work is supported by the Alcohol & Drug Foundation and local services, such as youth services, council and more. We partner with other organisations too and some of the things we are involved in, are things like free breathaliser services at local festivals such as Splendour In The Grass, BluesFest and the Falls Festival. How can people support your organisation through donations or by volunteering? BUDDI and the Schoolies HUB always need supporting, financially and through volunteering. We are definitely on the look out for businesses or anyone really, who would like to assist us by donating funds to our work, or sponsoring our activities, such as the Schoolies HUB. To help with donations, sponsorship, or to find out about volunteering, contact BUDDI Byron Inc. on hubvolunteers@yahoo.com.au or 0404 013 177 for Nicqui Yazdi directly.